The 9V Energizer Industrial Alkaline batteries we are testing here are what the ones indented for Professional and Industrial use, however looking through the datasheet of the Industrial and regular 9V Energizer batteries we see pretty much the same specs, so in theory these should be the same batteries. Regardless if we are talking about the Industrial or Regular version of these batteries they are considered to be one of the best 9V Alkaline batteries available on the market and we are just about to see if that is true or not by testing them. The battery tested here is with an expiration date of 03-2017 and with a 5 year shelf life it should be produced in 03-2012, this date is very important if we are going to compare the Industrial and regular batteries to see if there is any difference. In order to test the capacity of the 9V Energizer Industrial Alkaline batteries we are using a constant current discharge rate of 0.05A (50 miliampers) and we have managed to get just 380 mAh or with other words a very good result, even though it is not the highest we’ve seen from a 9V Alakline battery in out tests so far. Have in mind that this battery has been produced more than a year and a half ago, so it has self discharged to some point, nevertheless this result is still very good and among the highest ones we’ve gotten so far. The 1.5V AA Energizer Industrial Alkaline batteries we’ve got here for testing are marked with a number LR6DP10 and a code 636105 on their box, and are marked as not for retail trade (obviously intended for industrial use as the name suggests). According to the specifications of the battery from Energizer they have an operating temperature of -18°C to 55°C (0°F to 130°F) and a Shelf Life of 10 years at 21°C, the warranty marked on the batteries being tested is 03-2019. Professional and industrial grade Alkaline batteries are usually designed to handle better extreme conditions such as low or high temperatures of the environment, so we are probably going to do some additional testing of the performance these batteries have under more extreme conditions aside from the standard room temperature of 25°C that we are usually testing at. Have in mind that higher temperature may lead to lower internal resistance, however higher operating temperatures for prolonged time may also damage the battery. The Milliamp-Hours Capacity of the 1.5V AA Energizer Industrial Alkaline batteries that Energizer provides for continuous discharge to 0.8 volts at 21°C is as follows: ~2800mAh at 25 mA load, ~2500mAh at 100 mA load, ~1900mAh at 250 mA load, ~1400mAh at 500 mA load. The 0.8V is the voltage for a totally discharged Alkaline battery cell, however we are testing with a cutoff voltage of 1V as at a voltage of 0.8V a lot of devices may not be able to function properly. Also we are testing at 25°C room temperature and the different temperature means different internal resistance and as a result it is expected to get a different capacity results. The Power Profile test checks how the battery handles different current loads before it reaches the cutoff voltage, the test starts at 0A and gradually increases with steps of 0.05A each 20 seconds until it the cutoff voltage of the cell is reached. 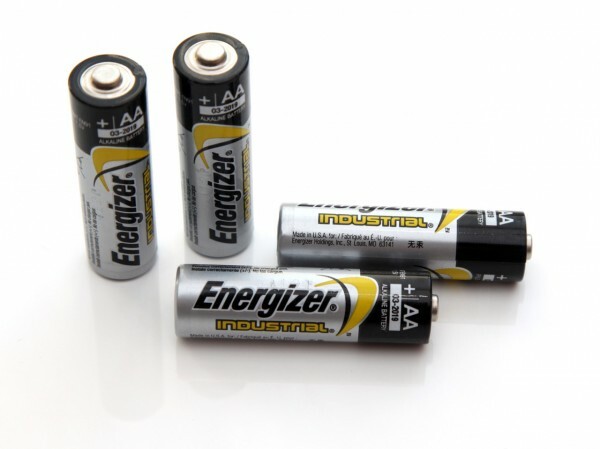 In the case of the 1.5V AA Energizer Industrial Alkaline batteries when a current load of 1.5A (which is quite high for an Alkaline battery) is applied the battery’s voltage quickly drops to the cutoff value, meaning that the battery is unable to handle such high current loads. Alkaline batteries are usually used for low current draw applications over longer periods of time due to their low self discharge, if you need an alternative of an Alkaline battery for high current draw operation over a shorter period of time you should consider choosing NiMH for example. 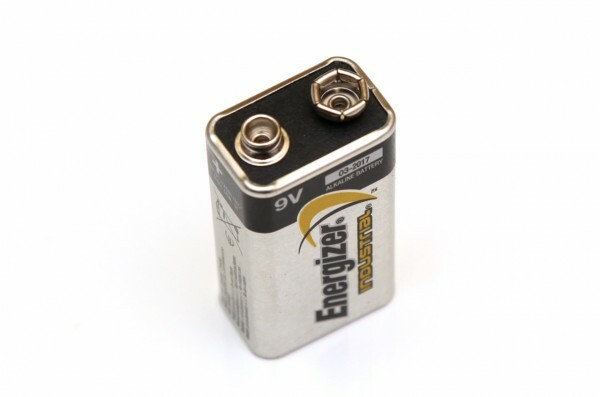 The Open Circuit Voltage (no load voltage) of the 1.5V AA Energizer Industrial Alkaline batteries is 1.61V, though under load it quickly drops to 1.5V or lower depending on the current load of the battery. We are testing all Alkaline batteries with a constant current load of 0.1A, 0.2A, 0.5A and 1A and measuring what capacity they can provide at these levels. With a duty cycle (on/off for the load) or with varying current load levels the same battery can provide different results, also not the fact that even when a battery reaches the cutoff voltage at a specific current load (especially for higher loads) this does not mean that it is completely depleted. This only means that your battery powered device may stop functioning, but after a little rest for the battery or with a reduced load it may work again for a bit more. The overall results we got are very satisfactory for an Industrial type Alkaline battery, and we’ve already mentioned why our results may be different than what Energizer provides as information about the capabilities of these batteries. Our tests show that the 1.5V AA Energizer Industrial Alkaline batteries are performing very well and they should be able to perform even better in situations with lower current requirements such as 0.025A for example.